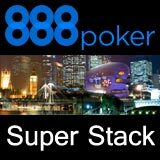 888Poker Super Stack Live Events take place at some of the best Casinos in the UK, Australia, Canada, Spain, Estonia & Ireland. 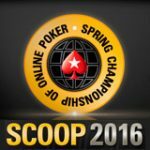 Players can win their seat in the online satellites to play these exclusive 888 Poker Live Tournaments. 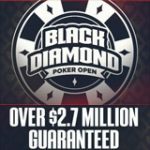 An excellent concept which combines Online Poker and Live Poker tournaments, the direct buy-in for the live events is (£165/AUD $300/CAD$185/€165) players can win seats online starting from $1.35. The 888 Poker Super Stack satellites offer an affordable solution for online poker players of all stakes to make the transition to live poker tournaments. 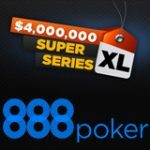 Poker players from the UK, Australia, Canada, Spain & Ireland can qualify for the 888Poker Super Stack Live Events in the weekly qualifying tournaments on 888Poker. Players can also use their bankroll to buy-in directly for the live events from the 888 Poker lobby. 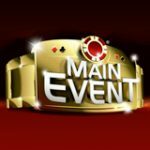 The live events are not guaranteed poker tournaments but an estimated £/AUD/CAD $15,000 prize pool is generated based on the amount of players entering the tournament. Win your seat to the live poker tournaments by playing the following weekly satellite tournaments online, the qualifiers guarantee seats to live 888poker Super Stack tournament at various Casinos around the World. These qualifying tournaments can be found in the 888Poker lobby by clicking on Tournaments then Live Events. Players can also win their seat to the weekly qualifiers starting from only $1.35, register for the Super Stack Step 1 tournament for the live event you want to play. 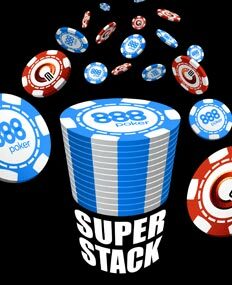 The 888 Poker Spain Super Stack events now take place at five casino venues - Barcelona, Madrid, Marbella, Valencia & Ibiza. Satellite tournaments are not available but players can buy-in directly (€165/$220) for each event in the 888 Poker lobby. Register for the live poker events, in the 888Poker lobby click on Tournaments’ then ‘Live Events’. Players who win their seat to a live tournament will only receive their buy-in for the event they wish to play, players will be responsible for their own travel, transport and accommodation to attend the live poker tournament. 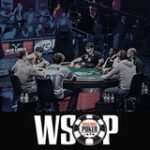 Players can transfer their seat to other players, players who win multiple seats to the same event can use their additional winnings as expenses. Players must be at least 18 years or older to qualify online and to play at any of the casinos.